What is the guarantee that the communist front can pull on till the end of their term, united or disunited? The political and diplomatic importance attached to first India visit by Nepali prime ministers reflects our folly in bilateral relationship, to say the least. Some Nepali leaders fume at this unheard of diplomatic courtesy but follow suit nonetheless. 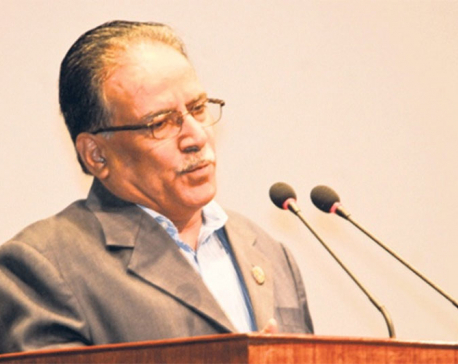 It is only a daring communist rebel like Puspa Kamal Dahal who broke the trend just to regret it. The other communist leader KP Sharma Oli was under heavy pressure to sidetrack it but he nonchalantly abided by the precedent. Nepali heads of government have a reason to tow the line not to start communication with Indian rulers with a jittery. 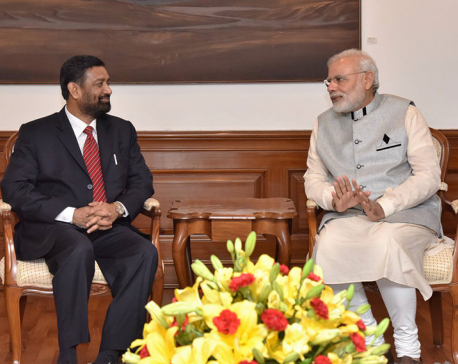 India appears to get its ego bloated by the presence of a Nepali leader in Indian soil without rhyme or reason. If a visit of this kind is to serve the purpose of spawning normalcy at a state level, so be it. But to believe in its merit and stick to it sounds little crazy and funny. That nevertheless shows rickety mindset on both sides of much-vaunted visit. Would not a shrewd diplomat exploit such an occasion in extracting unwarranted benefits by preying on gullibility? With the dangers inherent in such ostensibly fallible behavior, it is better for both the sides to abandon this tradition to mutual advantage and understanding. What is really serious is the attitude they build up in their mutual relationship. Nepalis have to be alert more about the attitude its neighbors show toward each other. Indian officials and media would want Nepal not to get too close to Chinese, not to even trust them and keep them at arm’s length. The Chinese, on the contrary, invariably advise Nepali leaders to maintain a good relationship with India, because they are not in a position to replace them. Even Mao-Zedong is reported to have admonished King Mahendra and his successors to adhere to this sermon. Nepalis, it seems, have to live with them perennially by listening to their homilies. The destiny of Nepal’s nationhood is undoubtedly set by Nepalis themselves. But they have, knowingly or unknowingly, tested with political systems their neighbors have emulated. Nepal followed the Indian path by adopting the parliamentary system of government but encountered big setbacks. Nepal also tested Chinese way of political control in the political and administrative mechanism. But it failed in both trials although India and China continue to pursue their respective systems with success. Nepal is still in a state of political and administrative experimentation of federalism, which is already demonstrating signs of financial burden fraught with potential tug-of-war in controlling the natural resources. So is secularism, a status of the state neither clearly understood nor explained. It is heading to eventual social tension, ethnic division and religious intolerance. With too many political and social obscenities around, it is doubtful Nepal will be able to embark on, not to speak of achieving, development agenda set by the new government. 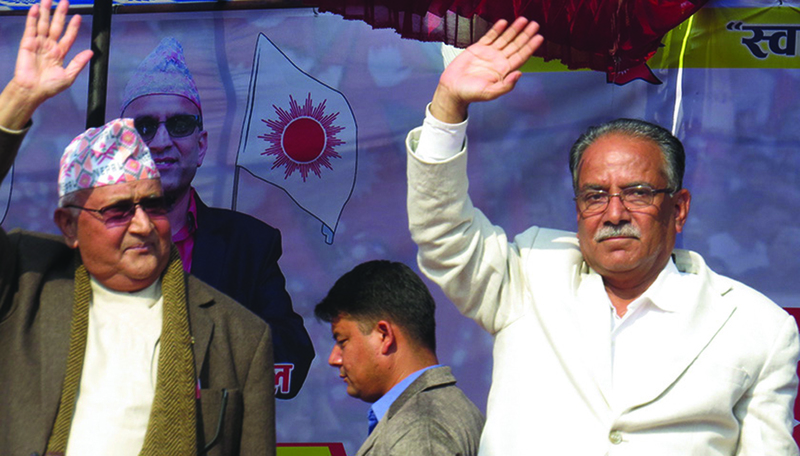 Nepalis have a bad habit of diverting to political trivialities like bringing on board Madhesi forces the government. It is up to the Prime Minister to maintain political balance in order to achieve his promises made to the people. It is his discretion to select the ministers and secretaries to get the tasks at hand performed. Even much anticipated left unity to run a strong government rests on ingenuity and skill of top leaders vested with power and management duty. They have been democratically elected in party and parliament. It is people’s duty to let them work and it is their responsibility to satisfy the people. Nepal needs to emulate the best combination of divergent ways India and China are following. But at a time when Nepal needs to act in the centripetal ways, it has adopted a centrifugal pattern like federalism. Nepali leaders pledge to learn from their neighbors and get benefited from their fast pace of development but they act to the contrary. There lies our fault lines in the future course of national development. The communist parties may get united in a huff to respect the popular mandate the people have expressed in the last election. But, again, the hazard lies in the suicidal character of political forces and the united front may get subjected to this woe. If history is any guide Nepali Congress had got absolute majority twice but it betrayed the people by falling apart from inside on both occasions. Similar was the case with CPN- UML. It was destined to secure majority in the parliament but failed to do so as it was split on the eve of the general elections in the mid 1990s. The Maoist party had become the biggest party in the first Constituent Assembly election in 2008 but it destroyed itself under the feat of newly gained state power. Similarly, kingship was abolished for its own faults rather than external factors. What is the guarantee that the communist front can pull on till the end of their term, united or disunited? They may lap their wounds with regret but it is the people who have to suffer.